On Wednesday, two police officers both unnamed were stabbed by a suspect identified as Hicham D. who pulled out a knife stabbing one officer in the stomach and the other officer in the neck before being shot in the leg. In what is being called a terror stabbing attack. Hicham D. pulled out a knife and spontaneously attacked the officers as the police officers were trying to check his ID. Then Hicham attempted to run away and escape but was later stopped by a second squad of police officers. That’s when Hicham broke the nose of a third police officer that officer then shot him in the leg and apprehended him according to Federal prosecutors and local media. “I saw the assailant who struck the officer to the ground… The officer rolled into the bushes but he [the assailant] took after him and continued the beating. After that he hit a woman, she was crying and bleeding. When the police arrived, they got out of the car and shot him,” ~An eye-witness, told Belgian broadcaster, RTBF. Belgian media announced that the suspect was a 43-year-old Belgian national who was allegedly a soldier until 2009. The motive is not yet known but prosecutor Eric Van Der Sypt, a spokesman for Belgium’s federal prosecutors suspects terrorism was the fuel for the attack. Prosecutors say they searched one house in Brussels but did not find any firearms or any type of explosive device. 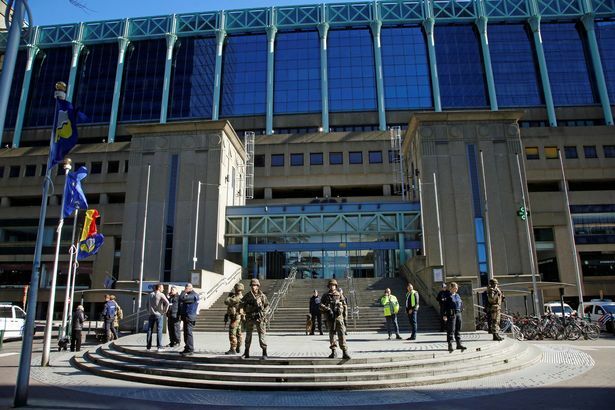 Which earlier in the morning an anonymous false bomb threat was made to the Gare du Nord (Noord) train station. The threat was later determined to be a hoax after the station was cleared by heavily-armed police officers. This comes as representatives of more than 70 world governments, including UN Secretary General Ban Ki-moon and US Secretary of State John Kerry, are meeting to discuss Afghanistan’s stalled peace process. Additionally, ISIS has claimed responsibility for previous attacks in Brussels. In August, a machete-wielding man shouted Allahu Akbar and attacked and seriously wounded two policewomen in Southern Brussels. Then we have the Brussels Airport suicide bombing attack that occurred earlier in the year last, March. Brussels seems like a breeding ground for terrorism even officially being nicknamed the hotbed for jihadism. ISIS has yet to claim responsibility for the latest attack in Brussels. “We are considering this as a terrorist attack now, yes,” Mr. Van Der Sypt, said. He neglected to elaborate on why officials considered the attack an act of terror. But said that the Belgian police were investigating whether Hicham D. had any contacts with suspected terrorists or foreign fighters over in Syria. Which is now confirmed that Hicham D had contacts over in Syria and has links to terrorism related cases and fighters according to RTBF.